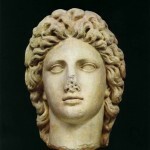 The 7th Ephorate of Prehistoric and Classical Antiquities is going to create a new museum for Alexander the Great in Thessaloniki, named “Alexander the Great: from Ages to the World”. His personality and his action, as they have been reformed by archaeologists through excavations and as they have been perceived by contemporary makers, like Oliver Stone and Andy Warhol, will play the “leading” role of the museum. Digital pictures, direct information, forums, an interactive map, a digital library, digital navigation systems, games, interactive documentaries and connection to the most famous platforms of social netting will be some only of the applications which will be included in the museum. The museum will appeal to scientists and organizations, but also to people of all ages and interests. The head of the 7th EPCA, Aggeliki Kottaridi, said that the new virtual museum will be worthy of the first citizen of the world, the founder of globalization. Mrs. Kottaridi will talk about this effort today afternoon, at the 24th meeting for the Archaeological Work in Macedonia and Thrace. The kingdom of Macedonia will be one of the central elements of the museum. Some of the subjects the museum will deal with are the traditions on which Alexander relied, his great course throughout time and space, the consequences of his action and his successors.